I hope everyone had a great Mother's Day! We had a nice time with our family and friends over the weekend. The sun is out today and I took a picture of our front door. I saw this cute French basket and thought it would look pretty. It brings a smile when I drive up to the house. Have a beautiful week and enjoy the outdoors. I don't do wreathes on doors really, but, I gotta say this is one thing I would hang on my door. It is beautiful! I love it! 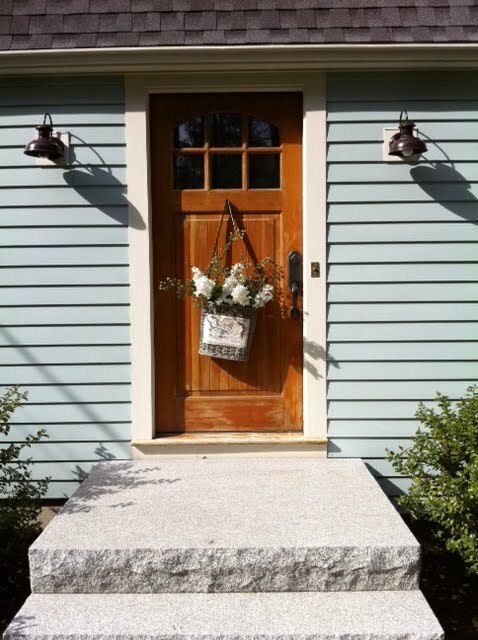 Your front door looks beautiful with it. I love the look of the basket with your gorgeous door and beautiful outdoor lights!! 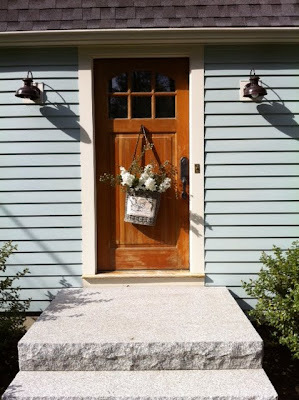 The basket is tres chic but your front door is gorgeous! Of course you have one of my favourite barn style lights flanking it too! I LOVE your front door design! It is just so charming and the basket almost puts me over the edge!! perfect and so welcoming! That basket is precious! I'd much prefer that on my front door than the old wreath that's barely hanging on.